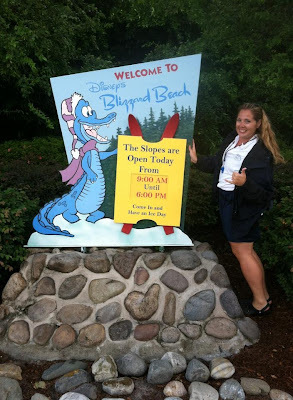 Holly in front of the Blizzard Beach sign! Before Holly emailed me saying she would like to participate in an interview, I honestly didn't know that slide ops was an option for recreation! (Learn something new all the time!) 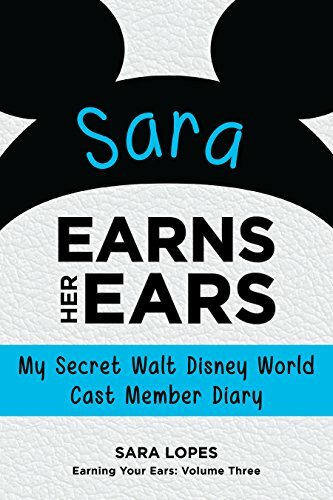 Because of this, I'm definitely glad that she was able to share about her role during her second Disney College Program! 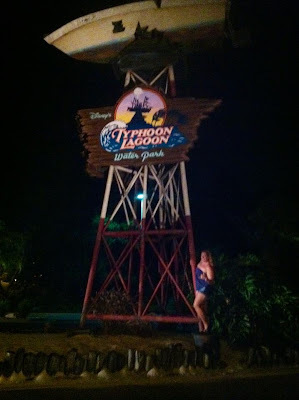 I was a recreation cast member working as a slide op at Typhoon Lagoon & Blizzard Beach. Every shift started at 9 am unless you were an opener then that shift started at 8 am. You checked in with the base coordinator of that day to get your morning job which was normally pushing or raking sand or re-setting a sand zone. At about 15 minutes before the water parks opened you had a morning meeting where you got your rotations for the day which is the schedule of what stand you start at and the time periods you'd be at what stand. Through out the whole day you were rotating to different stand about every 30-40 minutes which made the day go by super quick. We also got 2 half hour breaks during the day which was a nice break. After the park closed you did your closing jobs which were normally to just pick up trash, towels & life jackets off the beach and then a breakout at 5:30 pm. A lot of the days during a spring program will be cold weather closings. When the temperature is forecasted to be below 70 degrees the water parks won't open and they give you the option to take the day off or get deployed to the other parks to experience different roles. Weather closings happen a lot during the late Spring & Summer, when the weather is inclement the park will temporarily close and you get to have a lot of interaction with the guests in the weather stations. My first program was the Spring of 2012 so when I came back for Spring 2013 I knew exactly where I wanted to work & under what role so when I had my phone interview I told them I only wanted to be a slide op & when I ended up getting the role I was super quick to accept it. My favorite parts of my job were just being outside in the sun all day, definitely the people I had the amazing chance to work with, and the fact that I had the set schedule of 9-5:30 everyday. Another favorite part was getting the chance to be deployed. I was able to work in all four parks, both water parks, and ESPN. My least favorite part about my job was the morning jobs because you did them for an hour before the park opened and it was just the time of the morning when the sun started getting hot. Some of them were just kind of tiring. A little blurry, but Holly's in front of Typhoon Lagoon! Being a slide op we didn't really have very many opportunities to give guest magical moments. But my favorite one I ever did was opening up Summit Plummet in the morning because at Blizzard Beach we have a family of ski captains (the first guests allowed in the park) and we bought them all up to Summit before the park opened and let them be the first guests go down and have the rest of the cast members & guests count them down. At Typhoon Lagoon our magical moment was the Big Kahuna, every morning we took the first family to arrive on a private tour of the park before it opens and then they get to "control" the waves in the wave pool for the whole day. Well this was my second program and half way through my first program I knew I wanted to do another one. I know so many people say this is the opportunity of a lifetime, but it literally is. Now that I'm home so many people ask me about my experience and a lot of my friends did the program or are going to in the next few months. Both of my programs were the absolute time of my life, I had the best role and I met so many amazing people that I became so close with and will be life long friends. Even before my first program I had a really good idea of what to expect because I had friends and coworkers that had done it in past years, I also became obsessed with reading a lot of vlogs and blogs like this one. The blogs and even the DCP intern site give you a ton of information that will really help you out. Definitely bring your rain jacket, even if it's sunny in the morning because the weather is so crazy especially during the spring and you will get caught in the rain. BUY CROCS! They are a total lifesaver when your on your feet all day, even though they're completely hideous. When you get the chance to deploy out, take it because it's a nice change to see how other roles besides your own works. Even though you're living in Florida and working at a water park, pick up the long sleeve shirts, pants, and fleeces from costuming because it does get really cold up on the mountains. Get friendly with your coordinators, leaders, and lifeguards because they all help you out tremendous amounts and will be your best friends. Try an opening shift if you can because it gives you a chance to do different morning jobs and no closing jobs. SLIDE TEST! It will literally be the best part of your day because you can test the rides and go in the lazy river. Make the most of your program. There's so much to do on a limited amount of time. Go to all the parks, resort hop, eat in the restaurants, hang out at Downtown Disney, explore Orlando, go to the beaches. The DCP is seriously a life changing experience and I wish I could just be a permanent CP. Network a lot because you never know when you'll do it. I networked with a bunch of my leaders and became close with them and I'm now a seasonal slide op at both the water parks.